Register Log In Piano World Home Page Forums Digital Pianos - Electronic Pianos - Synths & Keyboards Garritan CFX Full middle E misfiring? 140 registered members (ADWyatt, Akaitsuki, alexk3954, anamnesis, agraffe, Animisha, anotherscott, Abdol, 38 invisible), 1,251 guests, and 5 spiders. I have recently discovered this odd glitch, and wonder if anyone else has come across it. Very occasionally, let's say maybe 2 times in an 8-hour session, the middle E on my Garritan CFX will inappropriately trigger while I'm playing. It happens so rarely that I barely notice the conditions for it happening, though I suspect it might be happening while I'm playing a chord that includes the E-flat next to it. I cannot reliably reproduce this glitch, so I am not too sure either. I am using a Novus. I cannot recall encountering this while I was using my N1 with Garritan CFX, so perhaps it's an artifact of the Novus? Last edited by rach3master; 11/08/18 11:29 AM. Sounds very much like a problem with the Novus, probably optical sensing being triggered by neighboring note? E4 is the 64th MIDI note. Sustain is the 64th Control Change event. This can be highly probable with cheap MIDI adaptor, or a too long MIDI line. With USB, checksums should avoid this. If you record yourself with a DAW - let’s say the 60days demo of Reaper - you can read the MIDI events and see what is really received. This seems like issue with Novus based on your accounts. You can use free MIDI-OX software to read MIDI events. To analyze, maybe you should start recording the midi values? I know Pianoteq has an always on recording. Does Garritan have this too? Then you can check the midi value once the glitch happens again. Of course if it does, and you record in Garritan, then you still don't know if the Novus actually sent the wrong value, or if Garritan changed the value and then recorded the wrong value. So maybe record with a different app? Or record directly on the Novus. I assume you have local control off anyway. So for the experiment, you could get into the habit of setting the Novus to sound mode (with local control off) and using the internal recorder on the Novus. You probably will have to stop and restart the recording every now and then, to avoid the internal recording buffer to overflow, but that is ok, as you don't plan to keep the recording anyway. Unless the glitch happens. If it does, save the local recording to a USB stick in midi format and analyze the midi event of the glitched E. If you find a problem there, then you know it happens in the Novus. If you don't find anything, then it either happens during transmission (which admittedly could also be the Novus' fault) or in Garritan. And then of course there's always the possibility that it's you, playing a mistake. Just reading this explanation it sounds very plausible. I play my NV-10 wth Garritan CFX Full almost exclusively, and I can honestly say that I've never run into this issue before. Frederic's explanation makes a lot of sense, but I have to wonder how often bit-errors like this happen to a point where they are noticed and easily reproduced "by hand." I do get extremely rare but repeatable issues with CFX, including spontaneous cut-out of the right channel (after ~50-100 days of uptime--I've posted about this before on PW). Why? Cosmic rays maybe? Who knows. Such an explanation doesn't come from my imagination. The first time I have read about it was about a 5$ cable adaptor. If one electronic part is not compliant, the issue may be frequent. Also, if the sustain pedal of the NV10 is continuous, it will send many events which will make the issue more frequent than with a on/off pedal. About spontaneous cut-off, it may be the CPU activity which is too much important. I did have many of them while defragmenting the system disk (not the samples one while playing... I a not that fool ). With Windows, you have so much things which happen in background, that it could be hard to predict any time dependent behaviour with a 100% precision. But too much CPU cutting a note must be very rare. I don’t think to notice some in a normal situation. (But I have some memory shortage with a 8GB PC). Last edited by Frédéric L; 11/08/18 05:53 PM. Well, I have the Novus and I have EXACTLY the same problem - every 4-5 days, more or less it depends, E4 plays by itself (sometimes big and loud) for no reason in the middle of a piece. I had the same setup before, with the same cable, but with a Yamaha N1 and I NEVER had any problems of any kind. Maybe it's the cable - but then why this problem wasn't there with the AvantGrand? I have Win 10 computer with a 5Ghz CoffeeLake I7, 32 gb of memory and the samples are on a very fast NVME drive, so I don't think it's the computer. The CC64 explanation is probably the right one - but I don't know what can be done about this problem. A midi signal repeater? Does a something like that even exists? I use a midi cable because I like to play with a very small buffer (64 samples) and the lowest latency possible. To analyze, maybe you should start recording the midi values? Perhaps your DAW or other software can do so? I know that Red Dot Forever software can ... and it's free. If you can do that, then record away ... and when you get that offending E, stop recording and look at the data. I have the exact same setup, minus the different VST. I suppose the Bayface pro to have an high enough quality. Perhaps the voltage/current sink or the timing of the NV10 is on the threshold of compliance and this imply such an issue. However, there is no real compliance chart in MIDI : « 1. Opto-isolator currently shown is Sharp PC-900 (HP 6N138 or other opto-isolator can be used with appropriate changes.). » we are left to guess if a change is appropriate or not. The MIDI Specifications limits the cable up to 15m. Here, https://www.sweetwater.com/insync/midi-cable-length-versus-reliability-latency/ a more conservative length limit is 7m (20ft). It is a pity in the XXI century to have trouble exchanging data at 31250 baud with expensive hardwares. I actually did that, because I wanted to have an example to send to Kawai, just in case. I kept Pianoteq running in the background every time while I was playing through VST Host - and was able to record the midi with the phantom E4! But the note had played by itself and wouldn't stop - and when I leave the keys and release the pedal, the note is still faintly there (because there is no note off for E4?). At the end it's me checking the note to see if it is in fact an E4. I don't know how to analyze a MIDI file, either. I was hoping to see the MIDI messages as raw data. That I could analyze. Then this shouldn’t be a ControlChange transformed in E4... or else, we would have seen some pedal (hold event on the text file) at close times. Perhaps a firmware bug. 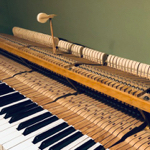 At MacMacMac : the text file is easy to read +E3 -> note on E3 (the following value is the velocity), -E3 -> note off E3 (with its velocity too), hold -> sustain pedal with its value (127 pressed, 0 depressed... and in between values). The number before each event is the time between this event and the previous one. The unit is 1/960 of quater note. I don’t know the tempo ! Note : it is not a standard notation. You can also load the midi file in Reaper or Cubase and use thr event viewer. But, these DAW may add a note off making all notes having a length... I prefer here to read the text file. Last edited by Frédéric L; 11/09/18 04:46 PM. I have missread the text file (there are e4 at the end). I have just read the commented +e4 at the middle... it is among hold (sustain pedal) events, the value (hexadecimal $64 = 100) is just between the previous hold value and the next one... then the +e4 is a wrongly transmitted sustain (hold) value. We should have received « hold 100 ». Your file confirm a MIDI transmission issue. One the link, there is only 1 bit wrong. I suspect it might be happening while I'm playing a chord that includes the E-flat next to it. Also there are hold events surrounding it, so the pedal was moving if I'm not mistaken. Hardware (either electrical on the cable or on the action itself) glitch - or firmware bug? I'm not sure, but always exactly the same bit changing sign seems to me a little improbable - a transmission problem would change bit here and there and we would see other strange things happening. So, at this point I believe it's possible it is a firmware bug: you play an Eflat, in a chord, with pedal moving - lots and lots of messages at the same time - and the problem is triggered. Last edited by Erard; 11/09/18 04:57 PM. I had a different mystery MIDI problem with my Kawai es100 & RME BabyFace interface a few years ago. Finally discovered that I had clicked "Enable MIDI Control" in TotalMix (RME interface software for Windows) whilst experimenting. So, disabling that (just reset the TotalMix software solved my A5 key mystery. Maybe try resetting your digital piano to factory. Then try resetting then reinstalling your interface software on the laptop. But when I bring up that MIDI file in MIDI Editor I see this ... with no E4 at all until the final stroke. Am I misinterpreting? Or is there a discrepancy between the TEXT file above and the MIDI file below?